I made this B&W conversion of my running child picture. I would like to know what you think of it, if it's good, or what you would do different. I tried to enhance the shadow (the child does not touch the ground) and of course this costed a bit in term of black safety for dark part - but perhaps not too imporant? The original is in the Brixellum series part 3. I also would like to know how you see it colour wise. On my apple/pc computer the grey looks neutral. On my laptop the greys seem blueish. My guess is that the laptop is the one with wrong calibration but I'd like to hear from you about it. I like it, Orio. 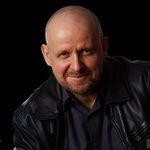 Perfect contrast, white is white (and not gray, one of the normal problems on B&W conversions), the image is vivid. Thanks Jes. Does grey look neutral on your monitor? Does grey look neutral on your monitor? On my calibrated monitor the grey is neutral. I have my personal taste with B&W conversions, usually adding a slight sepia hue (about 4-8%) as it seems more "photographic" to my taste. On first sight I thought there was a very slight violet hue in the photo, but no, it isn't. Seems pretty good on my display. I also like the exposure. Contrast is great, not too strong but strong enough to make an impact and the very tiny areas of burned highlights (top of the small columns) or deep black (this little whatever-it-is mid right) are not at all disturbing - on the contrary I think they add to the message of the picture. Grey looks neutral to me and there's a good range of tones with enough contrast. Yes, I don't see any hue in my monitor (Lenovo T61 laptop's one). Thanks! THis feedback is important, now I know that colour-wise I can trust my Philips 220WS, a monitor of which I am so incredibly happy. The images really pop out of it, and the photos with "3D" seem even more so. really? I like the play of the diagonals. I don't like much B&W so I wasn't want to make any comment, but I guess Alessandro has right. If you look well, the column is not perfectly centred. Also, there can be central elements if the rest of the composition balances them. It all depends on the composition, there is no absolute rule. It's absolutely a matter of taste Orio , but I think it's useful to express our own impressions and experiences. I don't like because it steals too much the scene from the boy or, if the pillar was the subject (not probable I think) then the jumping boy is distracting. 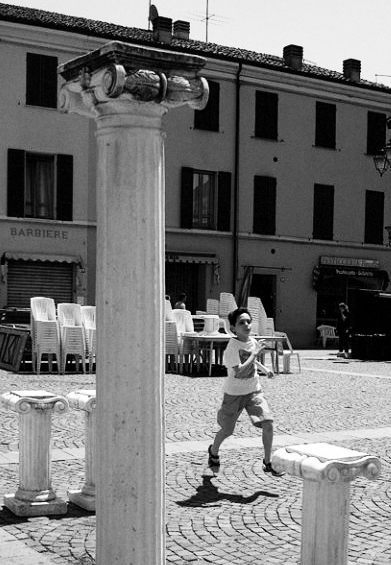 I was photographing the columns and the child ran in. I could "pose" the column, but I could not pose the child! How would you crop it? hmmm... yes, I like it. More centred on the child. But at the same time, it feels like it lacks the context of the piazza (the larger space, the people on the left). I don't know. Immediately, I liked your version better. Now, after some minutes, I feel leaning towards first version again. BTW, is your contrast curve also applying some noise? Yep, it adds some simulated grain (I like it a lot in B&W). I will try your crop but keeping my tone map. If you will do it, just move the frame a tiny bit to the left so to keep the little pillars all into the frame and moving a bit the child off center (btw, I love that barber shop insignia). What is the software that you load curves preset from, Alien Skin Exposure? Precisely. It's really great because it also gives you complete control on about everything.